This morning I woke up for the fourth time, late, in a sweat. I'd gotten to bed after two o'clock in the flash-flooding morning and was planning to sleep in late, which in my house of many occupants means sleeping through several earlier awakenings. It was around eleven, and amidst the pile of matters that rushed to my head as soon as I was relatively conscious, the stack of letters I had to sort through and mail as soon as possible was foremost. I felt sick. I'd fallen asleep in a state of soul similar to the thundery, lightning-flicked weather: whirling, wet, full. My graduation party yesterday ended in an exciting flurry of extreme weather, and once I wound my contented and reflective way home in the middle of the night, my mind and heart were as full and heavy as the clouds. This was the Last Big Thing connected with the end of the school year that I'd needed to get through, and it was gotten through. Here I was, quasi-grown-up and more independent than perhaps I should be at this stage, feeling ready to take on the world on my own but not sure if I should. But I'd fallen asleep to the sounds and words of Josh Garrels' "The Resistance". How do good men become a part of the regime? They don't believe in Resistance. like an anchor in the storm. I have to have periodical reminders that just because I feel some way, I don't have to believe that way; that just because I want something doesn't mean it's a good thing. Resistance. Resistance to lies, laziness, and despair logic. These song lyrics that had lulled me to sleep got me out of bed when the mortifying weight of late Thank-You notes and a messy room were chaining me to the mattress. Resistance. I read my Bible a bit, pumped the Josh Garrels album through my headphones, and set in on the stack. I walked the bundle of mail to a nearby postal drop box and returned an empty milk bottle to the co-op. * My messenger bag and my heart were both a good bit lighter on the return journey, with tasks squarely faced and accomplished. I am now lying on my red-quilted bed, listening to more Josh Garrels and typing. Peace is washing over me. To get through life in a way that doesn't lie about who God is, I need to be intentional about keeping myself in the right frame of mind. Lacking the rigid structure of a full-time job or studentship and possessing a large degree of independence, responsible, independently motivated time management is crucial to not wasting my life. But what is just as a crucial is heart-management. when it breaks like lightning across the skies? I feel like a little boat on turbulent seas. Watching the winds, positioning the sail to catch the air right. Watching the birds that wheel overhead and drinking in the different flavors of salt air that come with my current surroundings. Bending down to look at the blues and purples and glowing greens and bright reds and yellows of the shallows. Listening to the silence, singing to myself. Peace takes work. But it can work. 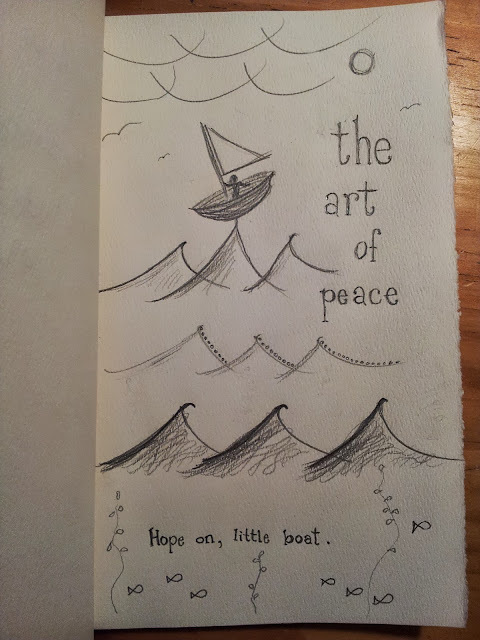 Hope on, little boat. *Though I wish I could say this very hipsterish action is a part of my weekly regime, the Organic Milk in the Glass Bottle was a special occasion event.